Madurodam is a small scale miniature town at Scheveningen (near The Hague) and is since many years one of the most important tourist attractions of the conurbation of Western Holland (called “Randstad”). On a scale 1:25 a charming picture of The Netherlands is given in bird’s eye view: several important buildings, churches and townscapes are reconstructed up to the smallest details. There is also a fine transport system: a network of railroads, harbours and motorways covers the park and Madurodam Airport enables air traffic with all continents. The miniature suite Madurodam consists of eight short parts presenting a musical impression of the smallest town in The Netherlands. the windmill theme comes back and then the suite comes to an end with the “Binnenhof” theme, decorated by the first strains of the national hymn “Wilhelmus”. 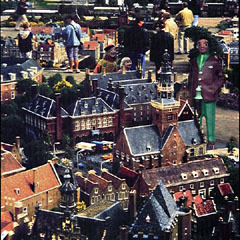 Madurodam was commissioned by the NIB (Dutch Wind Music Institute) with financial support of the Composition Trust “Fonds voor de Scheppende Toonkunst”. 3. Mallets - Bells, Vibraphone, Tubular Bells.